It’s hard to believe Jack Edwards is only 18. In addition to his imposing 195 cm frame, his mixture of aggression and composure at the crease, could fool many into thinking they were watching a much older player. Jack was one of the shining lights with the bat for Australia's Under 19s in their six-match series against Sri Lanka's Under 19s in 2017. Despite being the youngest member of the squad, he had one of the biggest impacts on the series. With a debut century in the three-day game and then 45 and 95 in his two one-day innings, the New South Wales all-rounder suddenly thrust his name forward for selection for the 2018 ICC Under-19 World Cup. Those who have seen Jack bat in the Pathways system have seen him dominate bowling attacks before; firstly at the top of the order for NSW Metro at the Under-17 championships, and then for the Cricket Australia XI at the Under-19 championships. 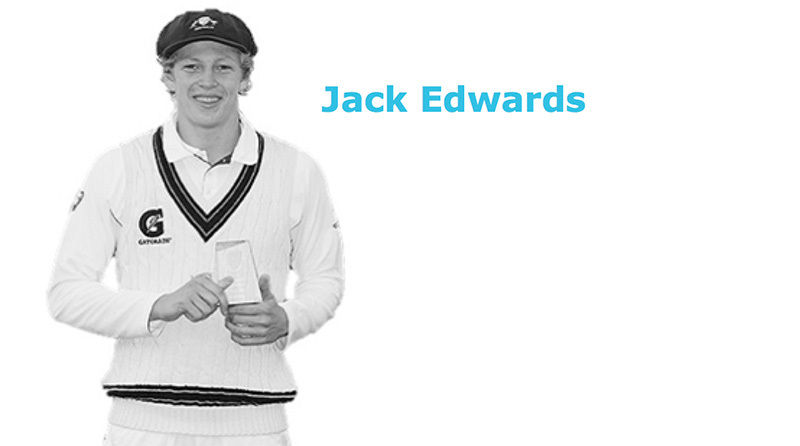 Jack is the brother of SCG crowd favourite and NSW/Sydney Sixers player Mickey Edwards. He also bowls at a rapid pace like his brother. He further solidified his reputation as one of Australia's most exciting young talents, scoring 147 for NSW in the U/19 National Championships final, in a Player of the Match performance to secure the Blues another title. In May 2018, Jack was rewarded for his performances with a NSW Rookie contract. He showed why is seen as a future star, firstly becoming the youngest centurion in the Domestic One Day competition, then scoring his debut first class century for NSW only weeks later. In doing so, he became the youngest player ever, to achieve the feat. Jack is also member of the Sydney Sixers in the BBL and plays 1st grade for Manly Warringah in the Sydney Premier Cricket competition.